The Blues transformed American music when it collided with European classical in the homes of Creoles of color and the bordellos of New Orleans, to create jazz. And it was the driver that turned the switch on every electric guitar to create Rock and Roll. Even Country Music has to tip its hat, Bill Monroe style, to the blues. Bruce Arnold (aka Arnett Brewster) grew up in Sioux Falls, South Dakota and remembers “when I was growing up in the mid to late ‘60s lots of people were playing the blues.” It’s not surprising: back in the mid ‘60s every rock ‘n’ roll band featured blues guitar, acknowledged or not. Arnett’s cousin Dave Wood, and LA session-musician-to-be Mike Miller turned him on to Robert Johnson, Lightnin’ Hopkins and the Allman Brothers Band. In high school Brewster joined locals “Stevie and the Studebakers,” rockin’ out on blues and pentatonic scales. Even as he ventured into the deep waters of jazz and contemporary classical theory, the blues never left him. And when he got his first lap slide guitar, it just came pouring out. Fortuitous indeed that an ace blues harp player was in the office next door! Dave Schroeder (aka Woodrow T. Greenwich) was born and raised in Carroll Iowa. Listening to his father’s record collection led to a passion for performing live music, and he caught local acts ranging from Chicago show bands to dance bands that played throughout the Midwest during the 60’s and 70’s. Bitten by the jazz bug early on, W.T. began playing saxophone and clarinet, eventually moving to New York City by the mid 80’s. While recovering from a stomach operation in the late ‘90’s, his brother sent him a harmonica to keep him occupied; from that day forward, he has been wrestling with the blues harp, and rediscovering often overlooked roots music in the process. Sometimes you just gotta get back to the root. And the odyssey that these two musicians have weathered has led them to create this very (deceptively) simple statement of self-penned down home blues, informed by a foundation of rock and jazz. Both come from the American Midwest where they had the blues instilled in their hearts from an early age. Arnold gave the tracks he composed (so to speak: in the blues, borrowings and adaptations are expected) titles from Old West slang. “Widow Maker,” almost painfully slow, is a hard to break horse. “Windies,” -a beguiling melody- are tall tales. “Wagtail” is fast – the word in the Rocky Mountains, according to LegendsofAmerica.com, for a prostitute. “Dakota Train Blues” is self-explanatory (and harmonica players, particularly those of the Southeastern Piedmont style Schroeder favors, often imitated trains). “Asher” is the brand of Arnold’s lap slide guitar. 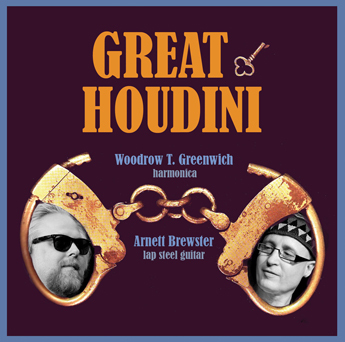 Great Houdini is an instrumental blues duet weaned on ice-fishing, Cold Springs beer and lutefisk. The blues has always lurked in the hearts of these Midwestern born natives now residing in NYC. Sit back and hear how flat plains, corn fields, big skies and the blues combine. To hear or purchase music from this CD please visit the Great Houdini page at the record company Muse Eek Recordings.